But what do you want your new kitchen to look like? What style should you select? Style is about more than just the décor. First of all, the shape of your kitchen plays a significant role in how it will look. 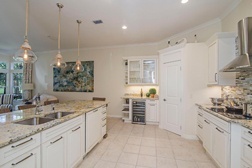 A Galley-style kitchen like the one you see here from a home we remodeled on Marco Island lines things up in parallel, with appliances and workspaces facing each other across am aisle. Galley kitchens lend themselves toward a more contemporary look that features sleek, clean lines and (often) glossy surfaces. That look may strike some as confined or seperated, but galley kitchens don’t have to be that way. Here’s a look at another kitchen with the same kind of configuration that evokes a much warmer feel—even though the alignment and layout is similar. This Gulf Shore kitchen has the same kind of layout, but uses rich cherry wood cabinets and a softer backsplash to provide a warmer look. For many homeowners warmth is synonymous with a more traditional style of kitchen such as the one you see in the Naples kitchen pictured here. This particular kitchen employs an “L-shape” configuration and also has a curved counter to provide casual seating in the kitchen. The cabinet material, counter material, and even the lighting help make this casual kitchen warm and inviting. Another style that’s particularly popular in Florida could be described as a “Beach-style” kitchen. In this Bay Colony kitchen, you’ll notice the use of lots of white with the louvered shutters at the top. And you’ll also see that in addition to lots of open floor space, even some of the cabinets have an open look to them. You may have something a bit more formal and luxurious in mind for your home. The Pelican Marsh luxury kitchen you see here uses chandeliers, crown molding, and elegant countertops to create a more formal kitchen that’s still open—and leads to the separate dining room. Those are just a few of the options available to you. I invite you to visit the kitchen remodeling section of our website in order to check out images of many other styles that might be what you’re looking for. You may also want to download out free Create Your Ideal Kitchen eBook for additional information on how to figure out your preferred kitchen style; questions to ask for determining your kitchen's level of functionality; and information on planning a kitchen remodel.